76 Central Motels in Branson are located in the light orange section of our area map . 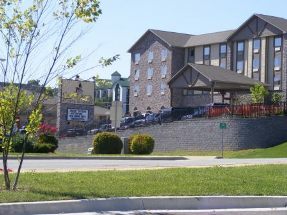 The area includes a variety of Branson lodging from economy to upscale as well as hotels and resorts. Using some of the alternate routes there is reasonably quick access to the lake areas, downtown and Silver Dollar City from this area. If you want to be in the middle of the action this is a great location. 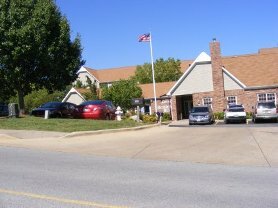 These 76 Central Motels are located on the strip between Forsyth Rd (across from Branson Mall) on the east and Gretna/Hwy 165 intersection on the west. 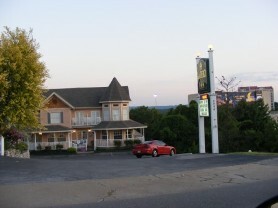 This 76 Central Motel is located just north of Hwy 76 on Francis St. There are quite a few 76 central motels located along this section of Green Mountain Drive. The road begins on the east end by coming off Hwy 76 between Branson Mall and McDonalds. Going south briefly, it veers to the west and continues to Hwy 165. 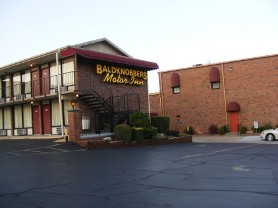 The 76 Central motels along Green Mountain Dr are modestly to mid-priced with great access. This is one of the better 76 central motels for families with kids. The water park provides the family an inexpensive but quality room with the added benefit of water activities. Many family rooms are available. This location is also listed under Castle Rock resort. This is one of the better 76 central motels for families with kids. The water park provides the family an inexpensive but quality room with the added benefit of water activities. Many family rooms are available. This location is also listed under Atrium Inn. The 76 central motels on Tanger Road provide a great location for those wanting to shop. Tanger Road goes north off the strip to the Tanger Outlet Mall. Tanger Road is located on the west side of Denny's and Krispy Kreme. Staying in the 76 central motels in Branson will keep you close to several fun parks and miniature golf courses as well the Thousand Hills 18 Hole Golf Course just south of the Strip. A full range of restaurants are located close to the 76 central motels including fine dining at Buckingham's, Andy Williams Moon River Grill, Landry's Seafood as well as diners, pasta & steak houses, fast food and ice cream and dessert stores. If you like to shop, making your base among the 76 central motels provides a great location for access to Tanger Mall, The Grand Village Shops and many individual stores. When looking for your Branson lodging the 76 central motels will offer superb choices with lots of activities. Whether you are looking for economy, modestly or mid-priced or upscale you will find 76 central motels that fit your vacation plans.